Rubanoid is a dragon/ruby-like Bakugan. He is used by Sid Arcale. In the game, Rubanoid is a BakuExo-Skin in Wave 3, and a BakuSuper G in Wave 4. Crimson armor protects Rubanoid effectively from attacks. He shoots red energy waves from his mouth, and attacks by shooting hard blades fast and mercilessly. His main Battle Gear is Destrakon Gear. He, like other Gundalian Bakugan, has a great hatred of Drago. It seems to be a mixture of Hawktor and Ravenoid in ball form. In Bakugan form, it looks like a dragon made of jewels. 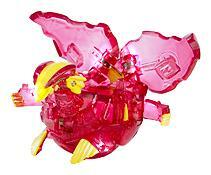 After pressing down its wings, Battle Gear can be mounted on its back like other Gundalian Invaders Bakugan. It's Aquos version has 900 Gs, and 620 Gs if translucent. Darkus version has 790 Gs, 750 Gs in the BakuBoost and rarely with 850 Gs, Haos version has 790 Gs, and it's Subterra version has 800 Gs. It's Pyrus version has 750 Gs and there are some with rare 850 Gs. It's Crimson and Pearl version has 800 Gs. It's in the BakuExo-Skin series due to his textureless skin. He was released in Wave 3. Purchase your Rubanoid Bakugan from Amazon now!